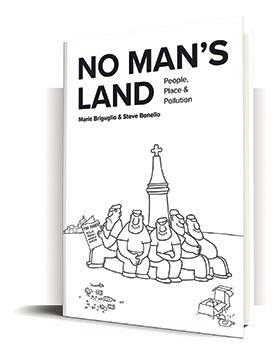 A few days ago I received a book from a dear Maltese colleague as a gift: No Man’s Land – signed by its creators Marie Briguglio and Steve Bonello. I read it really fast, not just fast, but in a breath you could say! And I was tremendously impressed. As a guest lecturer for a year I am more than a little interested in Malta and, as a passionate cyclist, in its roads, lanes and environment. Centuries ago I studied history and I was struck by the history of mentalities (histoire des mentalités in French), which focuses on the mindsets of past cultural and social groups and their gradual changes over time. For instance how people dealt with death, with raising children, with intimacy or with suffering. This book is how people, Maltese people, deal with society, with environment, with rocks and stones. Next to economy and history, it is also a book about anthropology. Jeremy Boissevain would be very proud of Maltese people like Briguglio and Bonello. They wrote a culturally shocking book about Malta, but one with hope, perspective and with a lot of humour. I read about Malta here – without divisiveness and helplessness. The text is poetic sometimes, in sentences like “people polluting public places”. Briguglio speaks about the “love affair with cars” (as if it were a hidden flirt), about “keeping birds in cages”. There is a beautiful sentence, “public spaces as a no man’s land on which it is permitted to throw rubbish”. Indeed, it looks almost like Sicily and Calabria sometimes. Nevertheless, we read about Malta: “Yet by many accounts it is also incredibly beautiful, rich in built and natural heritage, teeming with life in vivid colours all sunlit against a backdrop of blue sky and sea”. I almost hear Armstrong singing: “Then I say to myself, what a wonderful world”. 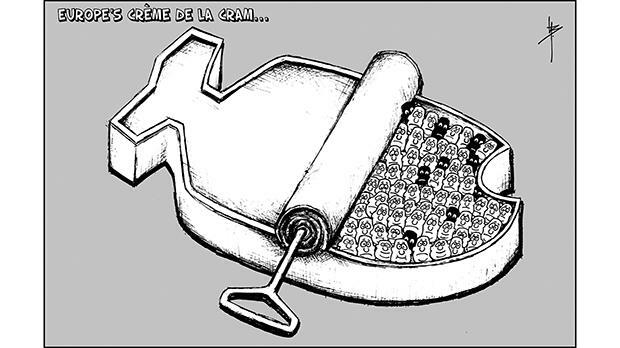 “In the darkness of the tragedy is a thread of comedy” as the pictures illustrate magnificently. Bonello has been at these cartoons for almost 30 years with subtle but convincing humour. 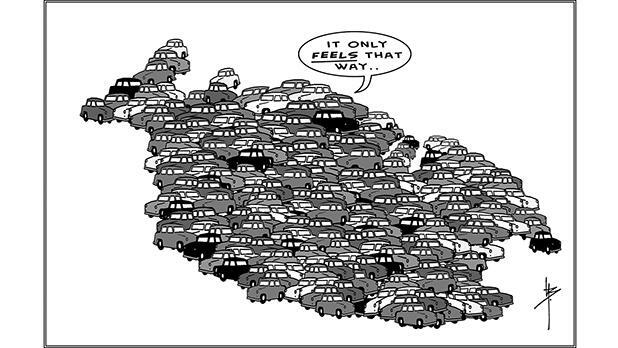 Every time I am surprised and shocked to read what is described with references and evidence-base: “It is theoretically possible to walk from the northernmost tip to the bottom of the island in eight hours (…) And yet, bizarrely, the Maltese are the Europeans least likely to walk and most likely to drive”. I used the cartoon ‘At least it feels like that’ five years ago in a booklet for the students from a number of European Universities. The description of the Catch 22 paradox is appropriate: “People continue to rely on their cars because buses run late. But buses run late because too many people are out in their cars”. We return to the Stone Age. The fact that 30 per cent of all property is empty and 95 per cent of the land is urban area according to the UN is striking. So is the fact that Malta is the second most dense network of roads in the world. It was very interesting also to read about the “yells, bells and smells”. I didn’t know this expression. I also didn’t know that Malta is the noisiest country in Europe. Until now I always thought it was Spain, but obviously Malta wins again! 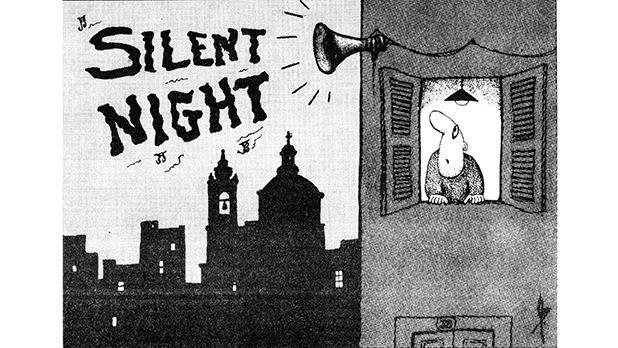 The beautiful ‘Silent night’ cartoon illustrates this well. And then there is the discrepancy of people being noisy and yet complaining about noise! I experienced the feast in Mellieħa with its noise and air pollution, but it also remains glorious and gorgeous to see. I read about Mepa, and about patronage. Finally, the brilliant sentence “the links between promoting environmental quality and other courses from promoting sport to health to culture to community and social well-being, spirituality and indeed economic prosperity suggests that civil society active for environmental cause will continue to grow”. A holistic and cooperative way of thinking that inspires very much. So, once again, my compliments for this beautiful book as an introduction to the beloved Maltese Islands. Theo Koning is a visiting lecturer from the Netherlands (Hanze UAS Groningen) at the Centre for Labour Studies, University of Malta.